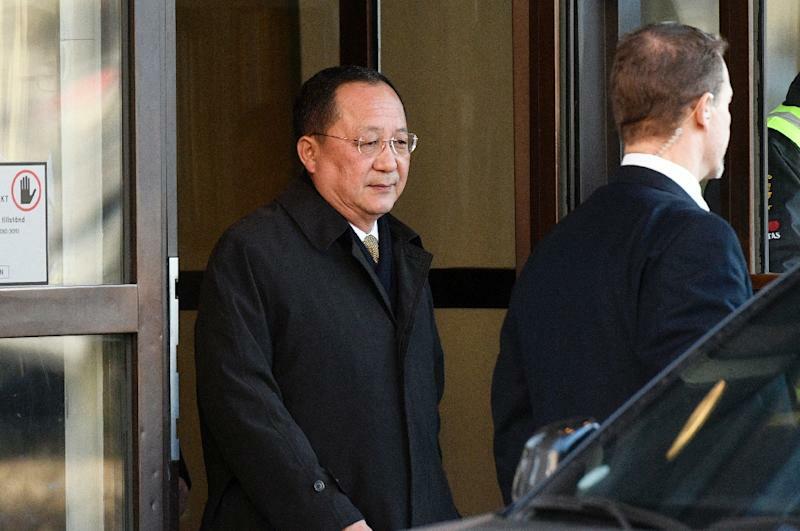 Moscow (AFP) - North Korea's foreign minister held rare talks with his Russian counterpart in Moscow on Tuesday, as Pyongyang moves to improve strained ties with its neighbours. Ri Yong Ho's visit came ahead of planned nuclear summits between the North's leader Kim Jong Un and the presidents of South Korea and the United States in the coming weeks. Russian Foreign Minister Sergei Lavrov welcomed Ri to Moscow on Tuesday morning, saying that "Russia is as inclined as ever to develop good neighbourly relations with North Korea". His North Korean counterpart said he hoped for further "development of our relations" in comments translated into Russian. After the meeting, Lavrov answered questions from journalists alone, saying the ministers "examined in some detail" the nuclear situation on the peninsula. "The Russian side confirmed that we welcome gradual normalisation of the situation, an end to mutual threats and readiness for contact between the two Koreas as well as between North Korea and the US," Lavrov said. He said that upcoming talks should aim at denuclearisation of the Korean peninsula, but stipulated that Pyongyang must also receive "cast-iron guarantees" of its security. He added that he had accepted an invitation for a return visit to Pyongyang, without giving a date. Alexander Vorontsov, a specialist on the Koreas from Moscow's Oriental Studies Institute, said it was "particularly important (for Pyongyang) to enlist support, including from Russia, to cover its back" before further summits. Ri visited Beijing last week for talks with his Chinese counterpart, after North Korean leader Kim Jong Un made a landmark trip to Beijing last month. The most recent North Korean ministerial-level visit to Russia saw the external economic relations minister visit Vladivostok in September. Kim was expected to attend 2015 celebrations in Moscow for the 70th anniversary of the end of World War II but opted not to go at the last minute. The leader's secretive three-day meeting with Chinese President Xi Jinping in March was his first trip abroad since gaining power from his late father in 2011. China is North Korea's main trading partner. The visit was seen as a gesture of reconciliation after months of high tensions over the North's missile and nuclear programmes. Kim is due to hold a summit with South Korea's Moon Jae-in on April 27 in the Demilitarized Zone that divides the Korean peninsula, in only the third meeting of its kind. A landmark meeting with US President Donald Trump is planned to follow -- although no specific dates or venue have been set. The diplomatic thaw began during the Winter Olympics in South Korea, to which Kim sent athletes, cheerleaders and his sister as an envoy. The stunning detente with the US comes after North Korea last year fired multiple missiles and carried out its most powerful nuclear test. Trump in turn hurled insults at Kim, calling him a "madman with nuclear weapons" and said that a military option against North Korea was "locked and loaded". If the summits with Moon and Trump are a success, "it will be a turning point, a breakthrough," said analyst Vorontsov. On Monday Ri met the head of Russia's security council, Nikolai Patrushev and on Thursday is set to meet the Kremlin's envoy to far eastern Russia, Yury Trutnev, Russian news agencies reported. Moscow has backed United Nations Security Council resolutions over Pyongyang's nuclear and ballistic missile tests. But Russia still has relatively warm ties with North Korea, with which it shares a small land border. Moscow also provides Pyongyang with some food aid, which Lavrov said Tuesday would continue. North Korea currently has some 35,000 of its nationals working as labourers in far eastern Russia, particularly in timber felling, agriculture and construction. Russia, however, is phasing out this programme in accordance with a United Nations Security Council resolution and began to send them home in February, although it refused to send them all at once and they are working out their contracts.